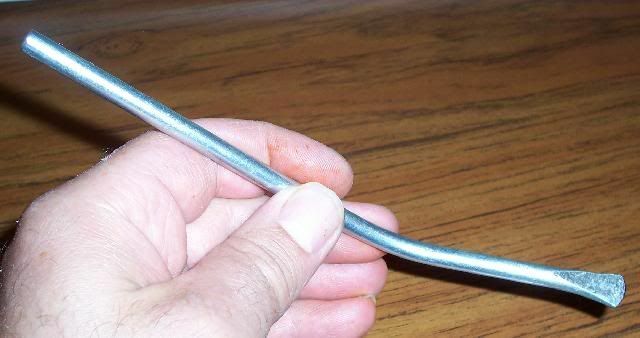 (EDIT 4-24-06) I have added a few new things dealing with drum temperatures at the end of this post and updated some other tips from forum members. Edits will show in blue text. Had severe spring camping fever today and started getting the TT ready for the season. 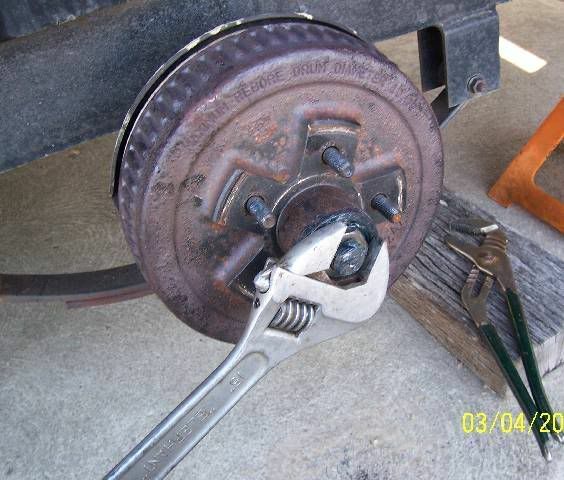 Shown below is how I do my annual brake check and axle relube. Be glad to hear from others on the methods they use. Always open to learning from others here. Also this may help someone who wants to do their own. 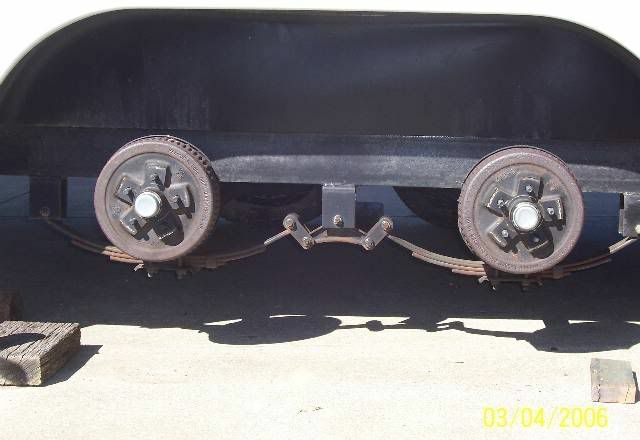 My axles are Dexter 3,500# axles, 10" diameter x 2 1/4" wide brakes on an underslung axle setup. If you want to read up more on this, see the Dexter manual. They have good manuals. (Edit 5-19-07) Note: If the link does not reach a working web site,go to under service manuals. They change the links from time to time. Since pictures are worth a million words here is the process I use. Then I take both tires off and you can see the axles real easy now. Looks like this. Then I start to pull the brake drums. I use a thin blade screw driver and lightly tap under the dust cap and pop it off. 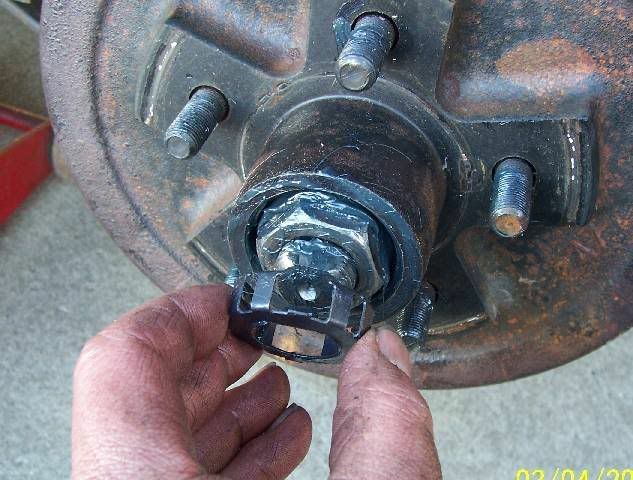 Take off the axle nut keeper and unscrew the axle nut. Most times it comes off by hand, but sometimes it needs a little help. These are right hand threads on mine. Next the drums pull off and the outboard bearing cone and washer comes out. 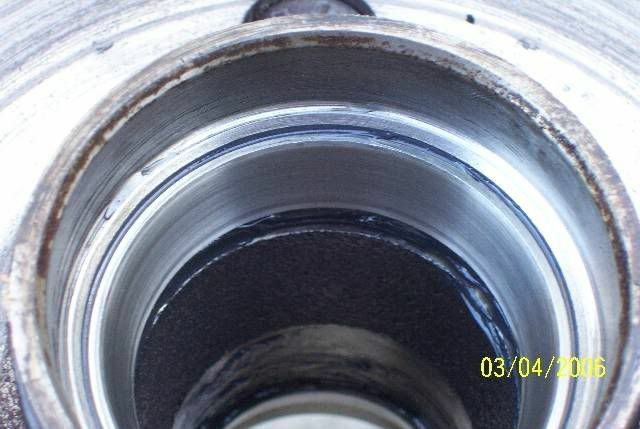 If your brake drums are not grove worn they will come off fairly easy. 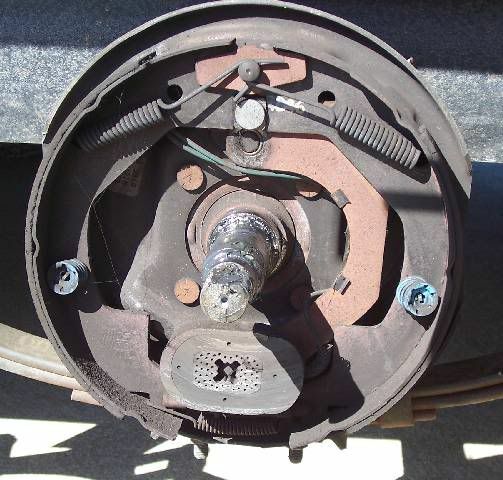 If it seems hung on the brake shoes and won't come off, you may have to unadjust the brakes first to get the shoes out of the worn groove in the drum. You will find lots of brake dust. Do not breath it. 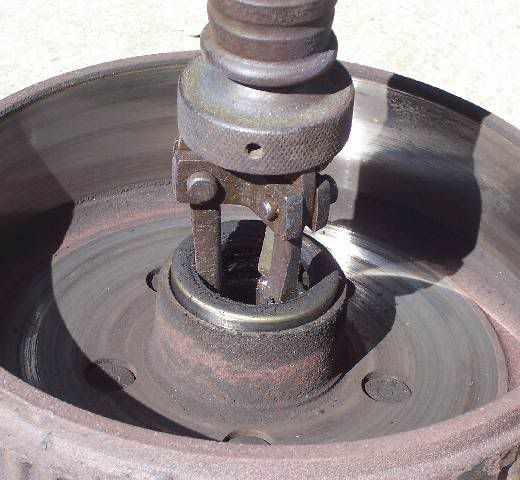 Next area is to get the grease seals out of the brake drum. I use a slide hammer puller. See the following reply's by other forum members on alternate seal pulling methods. Once all the parts are off, need to clean them all up. The bearings get soaked and cleaned in degreaser. When cleaning I always keep the bearing as a matched set with the race they came from. I also clean out all the old grease from the hubs and clean up the brake shoe area ready for inspection. This is the first cleaning on this new TT after a year of use. WOW I was amazed on how little grease Dexter put in at the factory. Yes the bearings where covered, but I'm sure glad I did not go more than a year. A good point to clarify brought up by fellow forum members, make absolutely sure you dry out the solvent from the bearings. Using compressed air works well for this. Left over solvent will breakdown the new grease. All bearing races also need to be inspected as well. 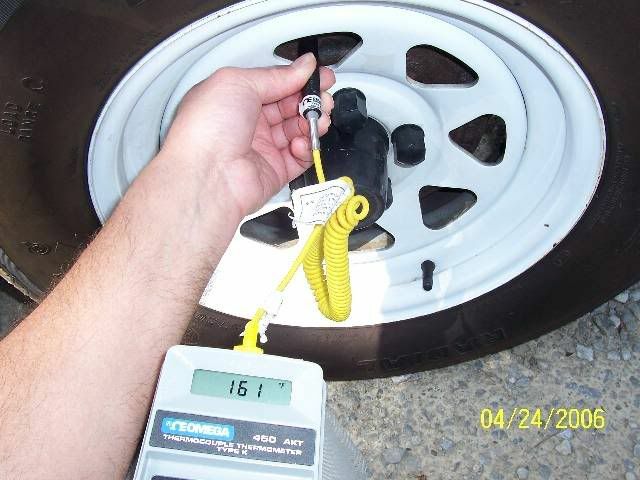 Again you are looking for uneven wear and pitting, small little holes in the metal or signs of galled metal. Then I inspect the brake shoes, linkage, springs, keepers etc. to make sure everything is OK.
Then comes the magnets, to make sure they are wearing correctly and do a close look at the brake adjuster to make sure it is not froze up. I very cautiously and with a rag in place, spray a little WD 40 on the brake adjuster. If you get any on the shoes, use brake cleaner to get it off. 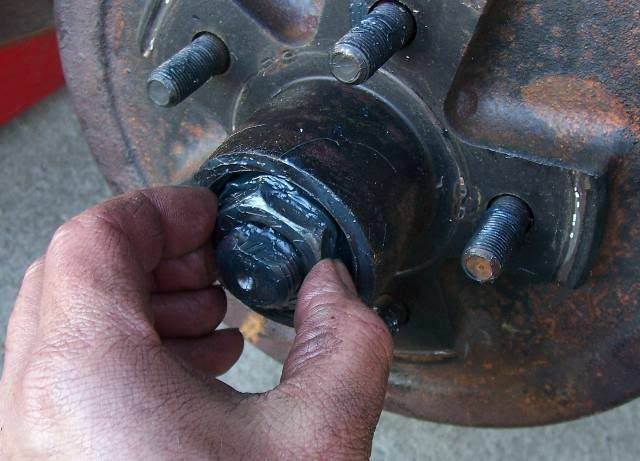 Taking the adjuster out and using Never Seize or grease on the threads also helps the adjuster from rusting. Just make sure you do not get any grease on the shoes. 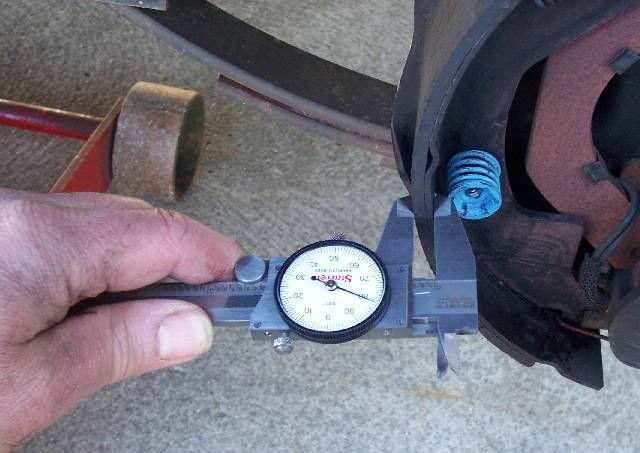 I measure and record the brake shoe thickness. I use the area by the shoe keeper pins so I always measure the same spot. Since I track my towing mileage, each year I can compare to last year and get a rate of wear per how many miles. This is just a heads up on when to buy new shoes for the next season. 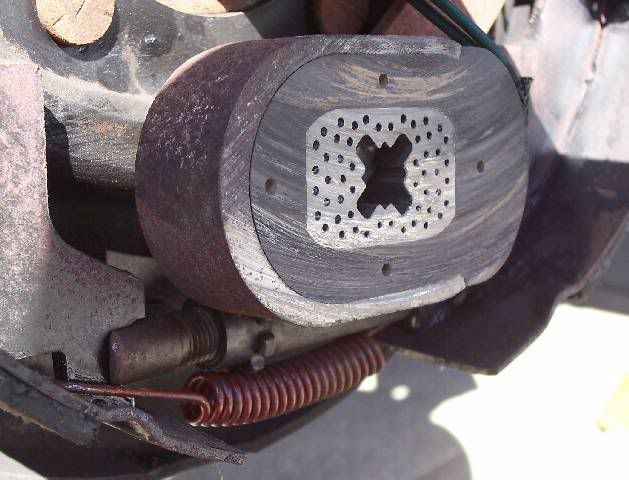 I then insect the brake drum for wear on the ID and the magnet surface. I'm also tracking the drum wear with measurements. Now it's time to put things back together. Grease job at it's best. One of these days I'm going to buy bearing packer but for now I do it the hand way. 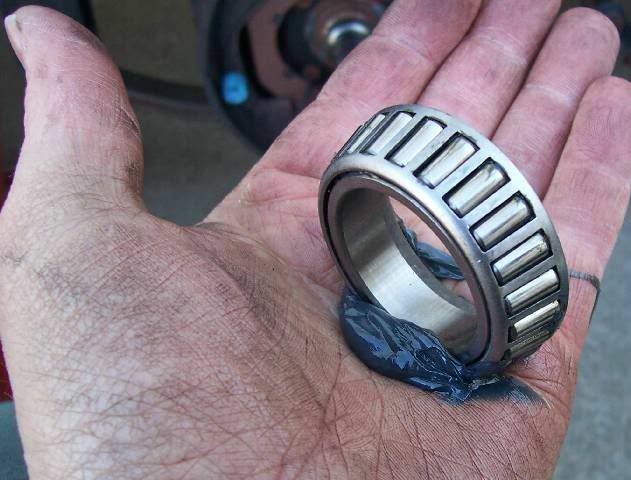 Put a glob of good quality high temp wheel bearing grease in your hand and press and rock the grease into all the rollers. Once all bearings are greased, I grease up the inner races and install the new seal. 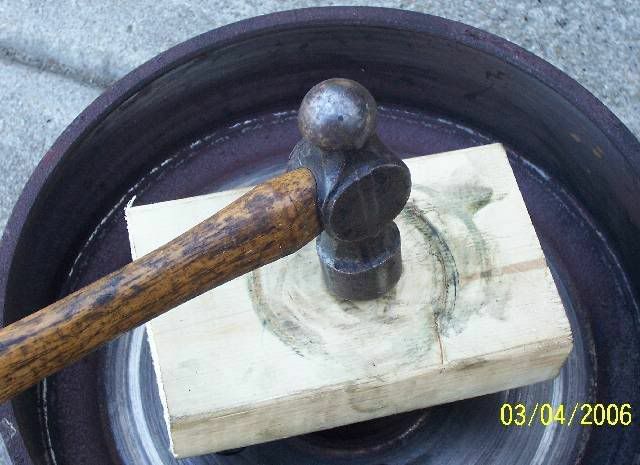 I use a wood block and gently and evenly tap the seal in flush. 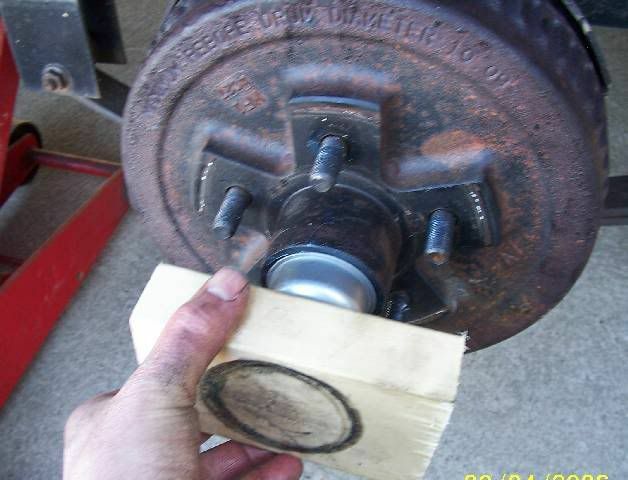 Then I put a light coat of grease on the axle and lube up the outer race and gently push the wheel drum on. I slightly rotate the drum and push so I can feel the seal going on the axle. Install the bearing washer and nut and I set the preload. At this step you are taking all the excess play out of the bearings and then creating some running clearance. 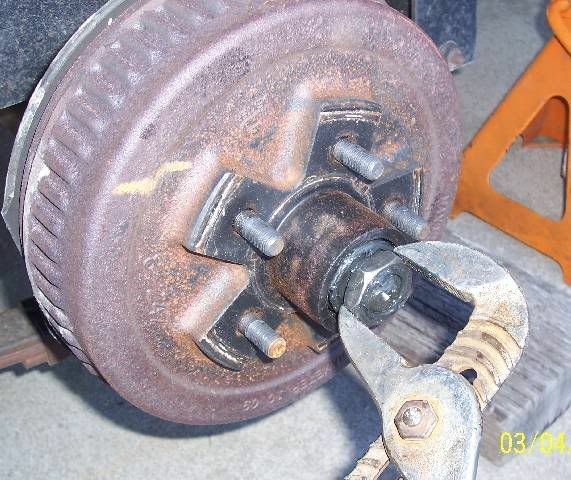 I tighten the axle nut and rotate the drum. Tighten to like 50 ft lb of pull. I rotate the drum a few times to make sure the bearings are seated. Then I hold the drum and back off the nut. Then by finger tight I take out all excess thread to the bearing inner race and stop. 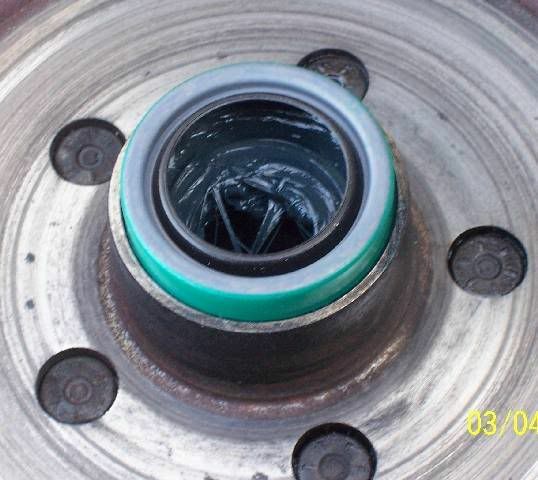 Do not move the drum, if you do, retorque and start over. Then I put the axle nut keeper on. Personally I like the older style castle nut and cotter pin, but this keeper is the new thing Dexter does. Then I use a block of wood and gently tap the grease cap back on. Since I have under slung axles, a treat to crawl under and get to the adjusters, this time I will adjust them with the wheels off. I had to make a tool to get in there with. All my regular brake tools do not work as you have to go in at an angle. This is what the tool looks like. 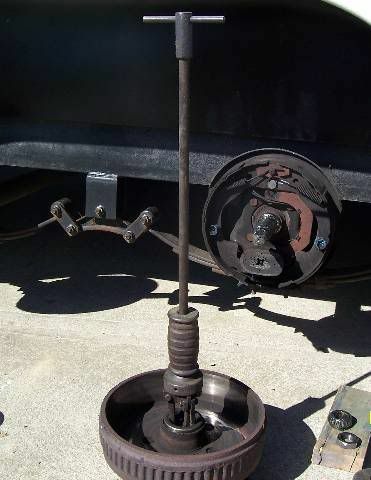 Now before you start adjusting, get a real good mental image of what the brake adjuster looks like. You are fishing in the dark. When I did the first 200 mile adjustment, I had to pull a drum to figure this thing out. They do not have the self adjuster lock tab like on automotive brakes to deal with in manual adjustment. Thank goodness.... The spring keeps the adjuster from moving, it drops in the sloted tabs on the adjuster stud. However I would reallllllly like self adjusting brakes. Having to adjust brakes manually is taking a step backswords like 50 years.... here is what mine looks like. The curved end of the tool especially helps. Here is how the brake tool sneaks in from the back. Once I get the drag set right and even, the wheels go on. 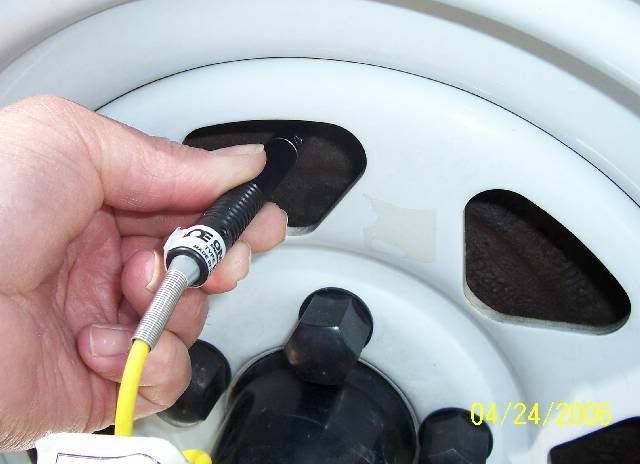 I torque each lug set in a torque pattern. On my first camping trip out after putting the wheels on, the torque wrench comes with me and I recheck them at the camp site. 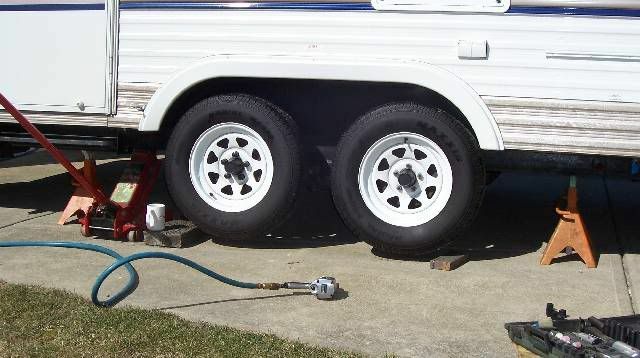 And then I check the torque about 2 - 3 more times at the start of camping trips until I know they stop moving. 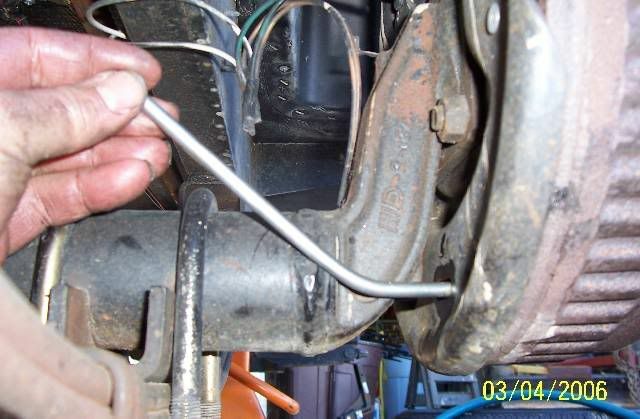 (EDIT 4-24-06) This is a new section is about hub/drum temperatures and checking that your brakes are adjusted equal. Here is some data from my setup. Yours may vary pending brand and setup. Once you have gone through the procedure above on setting the brake shoe tension, I do a drag test to make sure all brakes are working even with each other. Meaning all 4 brakes are applying at the same time. One way I do this is what I call a drag test. There are other methods, this is only one of them. It helps to have pulled a few miles to seat everything, but the test can be done directly after rebuilding and then later after 50 to 100 miles or when ever needed. I use my gravel drive way and my son as a spotter. I have him watch one side and both wheels. I start driving about 15 - 20 feet, about 5MPH, let off the gas and then lock the brakes up. A slight drag will occur. The spotter looks to see if both wheels came on at once. The little dirt pile in front of the tire helps show this in case he missed it. The dirt pile should be similar. Do this on both sides. Tweak the brake adjusters as needed to get all 4 to lock at once and come on at the same time. Again the little pile of dirt just ahead of the tires help tell you if they are all locking at about the same point. The next topic is hub and drum temperatures. 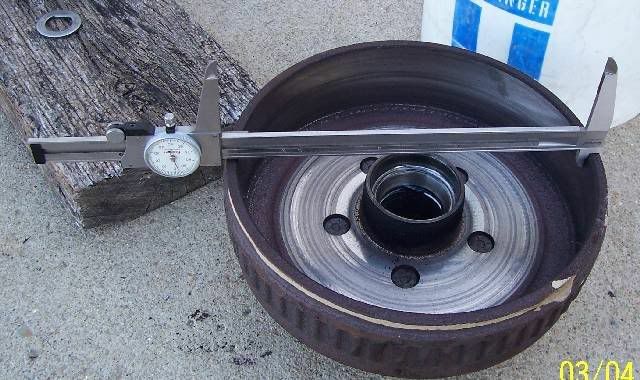 These can help tell you if you have one brake working a lot harder than the rest or a bad bearing or to tight a bearing. When checking temperature, use the same spot when you move to all wheels. This will give you better comparison if one wheel is too hot. The drums are hotter the further to the edge you go. Here is the hub temp. I have plastic hub caps so next to it is as close as I can get to the bearings. I use the same spot on all wheels. Ideally right on the bearing housing is best. Next area is the drum temp. I sneak through the spoke holes. I put the probe right on the OD of the drum. 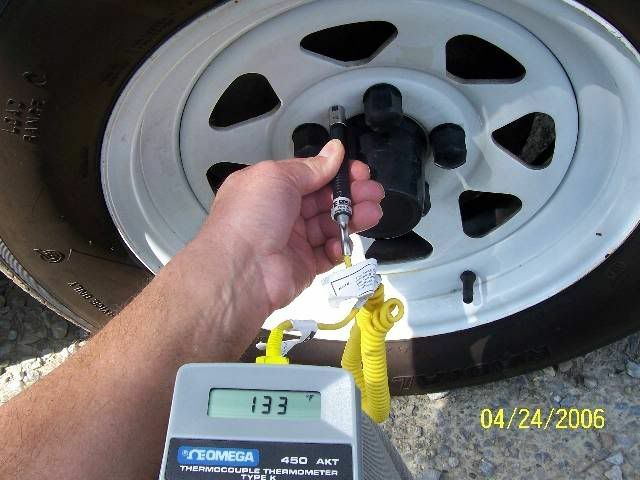 I do this so I can measure the same spot on all 4 wheels. Here are some of my TT temps. These work on my rig. Yours may be different and how many times you brake affect these. Again key is are they all in the same range? Range meaning within 5 - 15 degrees not 30 to 40 plus degrees apart. My 6400# loaded TT doing 60 MPH highway driving for 30 miles. Little braking, pulled into rest stop and took these. I then traveled the rest of the way home, another 80 miles. Pulled in my drive way and took these. Here I had more stop and go traffic in town. In the past I have had one wheel show a drum temp at ~ 200 - 205F. I found that a drum temp. this hot while the others where in the 150 to 170 range showed that that wheel was adjusted to tight in relation to the others. It was doing more stopping then the rest. The drag test showed it locked first. After adjusting, it was even with the rest. Well this is what I do. Any tips on what you do? Awesome. It should be a sticky. Thanks for the tips. 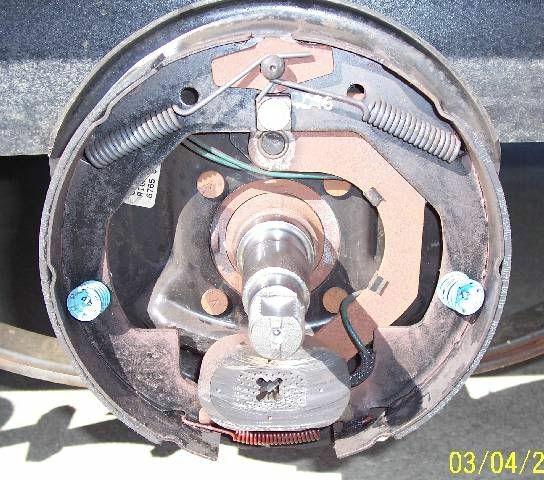 I'm getting ready to adjust my brakes and I'm hoping I don't have to remove the wheel and drum. Now I know what the brake adjustment tool should look like. John, your clear explanation and GREAT photos will really help a lot of us. Thank you, very much, for taking the time to post these! Nice job. The only thing I hate doing is the brake adjustment. The rest is kinda fun. One note though, the Axel nut does have a torque spec. Too tight or too lose can be bad news. Fantastic job and seminar! Haven't done mine in years. CALM DOWN, I watch someone local do it for me. They may have tried to get me in Air Force ( plsne got tired) but I fooled them,. Heavy work I supervise and light work I groan...but RV'ing I go. JBarca, did you invent that seal remover? That is a good idea. Only question I have, why be so careful to remove the seals when you are replacing them with new ones? That is a great post JBarca, one of the best I've seen on here! Dave & Jerrolyn, Zachary, Jake & Maxx and lab "Cody"
'00 Newmar Dutch Star 4093 CAT powered pusher. Thanks for the nice comments. I'm glad this helped some folks. That was the intent. I have learned so many things in such a short time here on RV Net that every now and then we need to give back. There are many ways to do a brake job, this was how I learned so figured would see if I could improve the task with feed back from others. What I made is a piece of 1/4" round stock, cut to length of your choice, forge (beat with hammer) the end to give you that blade shape. The round tip comes along for the ride. Then bend to suit your needs. Nice job. The only thing I hate doing is the brake adjustment. The rest is kinda fun. One note though, the Axle nut does have a torque spec. Too tight or too lose can be bad news. I fully agree to tight and too loose is bad news. To much heat one way or the other. We actually preload Timken's with indicators on certain machines requiring high precision and no end play at work. In this case I did not come up with this tightening method, Dexter did. I may not have used the right words, and may need to change what I wrote. Right out of the Dexter manual, See page 51 of the Dexter manual. Basically they are using the 50 ft. lb # to seat the bearings and take out all the play. Then you back off the torque while not rotating the drum, then bring the nut back up finger tight. This in theory is close to no preload or slope on the Timkens. If the words I used did not translate this, sorry. I meant it to be. No I can't take credit for inventing that puller. I had the one in the pic for a long time. End up acquiring it for doing some work back when I was like 16. Which at this point, let's just say was a while ago... It is a inside/outside slide hammer puller. You can flip the jaws around and the cone on the bottom locks them. Mine is made by Proto. Searched them on the web and they still make it, just slightly updated. Now why to be so careful when removing to replace. The ID of the seal is still messed up using the puller. However I did not scratch up the hub bore that the seal is pressed in. If you do not have a puller the options are sort of a screw drive with a hammer and dig and pry. Yeh it works, but if you have the puller, it is easier. Thanks to all for responding. More welcome too. Very nicely done that should help allot of folks. The description for the packing can be hard to explain but it's always easier to show someone than to explain to someone. Not to add much but how's this for the repacking description: Place a dab of grease in the opposite hand you'll be holding the bearing in, then holding it wide end down and at an angle, press and rock the edge of the bearing against your palm and occasionally moving into the grease a bit in your palm working the grease into bearing between the inner and outer housing (excess grease that gathers in the middle just put back in the pile from time to time) until it begins to come out the top edge, then move over a little (turn the whole beaing as one do not rotate the housing). 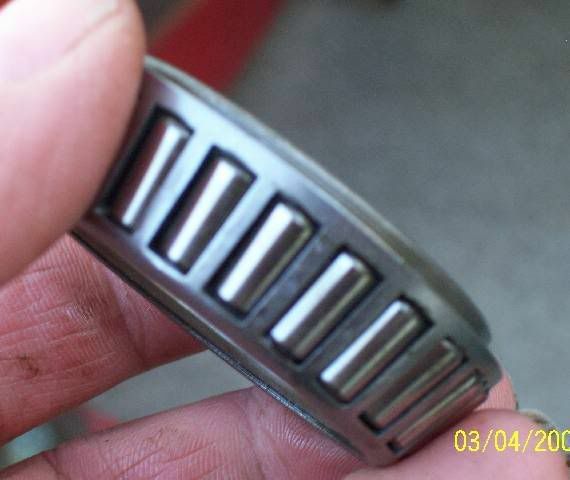 Keep this up working your way around until grease has oozed out of the top gap all the way around the bearing and you're sure it is totally full. I went to the website to check out that tool, it comes in a set for $478. I believe I can make one for less than $20.00. As for my sig. picture, I think it was taken in Tennessee and sent to me. It is sort of a jab to those who post their $500,000. rig as a sig picture!